Taylor Robinson and panelists at the conference. Photo courtesy of Petroleum Connection. PLG Consulting’s president, Taylor Robinson, was part of Petroleum Connection’s 7th Annual Frac Sand Supply & Logistics Conference in San Antonio. The event was held in late October and over 700 industry insiders gathered to discuss the most relevant topics in a dynamic industry that has hit an inflection point this year. Following are his observations. The U.S. oil and gas industry will likely consume over 100MM tons of frac sand this year with numerous new mines coming online within driving distance of a majority of the wells, shifting the logistics focus squarely on the last mile. Changing sand/logistics buyers and new sand hauling and storage equipment continue to evolve and offer an opportunity for efficiency improvements. Future demand will likely be steep as major producers increase production, especially in the Permian. However, demand will not be enough to swallow the added supply. What’s more, all of this is dependent upon healthy oil prices. Local in-basin sand is now firmly entrenched in the Permian and is quickly growing share in the Eagle Ford, SCOOP/STACK, Haynesville and possibly the DJ shale plays. While there are still rumblings about quality issues, most are saying it is “good enough” and can cut the total delivered cost around $50 per ton depending on the play. As more producers jump on the bandwagon, it makes it harder for the late adopters to deny the benefits of local sand. This paints a challenging picture for the Northern White producers, railroads and railcar manufacturers/lessors. The rapid build-out of in-basin sand has flipped the market to oversupply starting this summer. Consequently, spot pricing for Northern White sand has plummeted to as low as $20 per ton FOB plant. In-basin sand pricing has held up a bit better in the Permian, but with more supply coming online yet this year and a fourth-quarter slowdown in progress, pricing will be under pressure. With such a rapid drop in market pricing, sand buyers that signed long-term contracts in the $50 per ton range are looking for ways to renegotiate their agreements. Q4 frac sand volumes suddenly look weak due to budget exhaustion and Permian takeaway challenges. It seems that producers ate up their budget early in the year which enabled rapid production increases. With dropping oil prices, it appears many producers will wait it out until their new budgets are in place after the new year. And with some earlier than expected pipeline expansions in the Permian starting now, things look to heat up by February. Expect record-level sand volumes as large pipelines come up to speed in west Texas in late 2019. Direct sourcing (aka debundling) of frac sand and other oilfield supplies by oil and gas producers continues to increase and will likely become the majority by 2020 as more of the larger producers begin to take greater control of their supply chain. With a growing number of sources of supply for sand, equipment and last mile logistics services, the transition process is picking up steam. Boxes or Silos: Which is the best frac sand storage solution? The rivalry between boxes and silos continues in full force as both solutions have taken substantial share from the conventional sand kings over the past year. With the industry volume at a lull, both sides are doubling down to gain share as large players plan for 2019 and 2020 growth. And the number of equipment producers continue to grow as it became known at the conference that additional box and silo solutions from Canada are coming to the U.S. in the near future. In the trucking equipment space, pneumatics continue to lose share to flatbeds (hauling boxes) and to a smaller degree to bottom dump trailers. Bottom dumps were expected to grow much faster in 2018, but the development of the conveying systems to the silos has proven more difficult than expected. However, the unloading time improvement coupled with larger payloads from purpose-built trailers will offer bottom-line savings that will be hard to pass up and take trucks off the road. The Permian oilfield is adjusting the shorter, leaner supply chain with local sand. With local mines usually having only several days of supply available in storage capacity, the mines may run out of storage space if a few customers push out their completion schedules and the mines will then have to shut down their operations. The new supply chain doesn’t have several transload facilities’ silo and railcar storage from the Northern White supply chain as backup inventory. The supply chain managers have therefore moved from weekly to daily planning to ensure smooth deliveries with less inventory buffers available in the shorter supply chain. Tight integration is needed between the sand mines, logistics providers and the well site to ensure smooth supply of sand. New supply chain technology solutions are another way to markedly improve efficiency, reduce bottlenecks and take drivers off the road. There is no “SAP” of the frac sand technology space yet, but several holistic logistics solutions utilize their custom-built technology to enable them to never run out of sand and to reduce demurrage. Integration into multiple systems has been a major challenge, but new solutions are charging ahead with some utilizing Artificial Intelligence to manage the dynamic environment. The panel members agreed that the current discussion around the sand direct sourcing trend started during the oil downturn in the 2015/2016 time frame and is in full swing with numerous E&Ps contacting the last mile panelists inquiring about buying their services. The panelists believe that the more direct connection between the producers and sand/logistics providers would lead to a leaner, lower cost supply chain in the future. The frac sand trucking market has been in a lull as volumes have flattened over the past three to four months resulting in smoother operations, adequate driver availability and price stability. This is expected to continue through the fourth quarter. However, rising volumes next year will quickly test the stability as the national driver shortage continues to plague all shippers, and a spike in demand in the Permian has a ripple impact elsewhere. 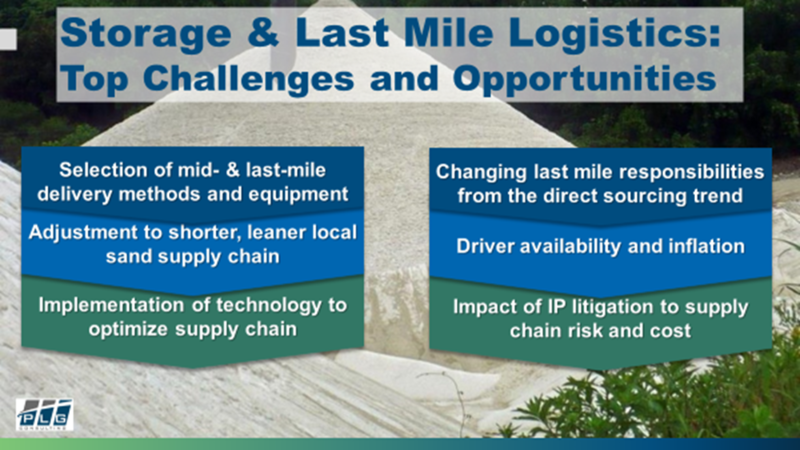 Although not a topic of discussion on stage, the growing number of litigation suits between last mile equipment companies is bringing pause to some last mile buyers as they assess the potential impact of these cases upon the supply chain. There are a wide range of opinions on the validity of known lawsuits and there are other suits rumored to be in the works. Stay tuned. The 7th Annual Frac Sand Supply and Logistics Conference shined a spotlight on the changing dynamics of the frac sand industry and revealed numerous opportunities for improvement and cost savings. 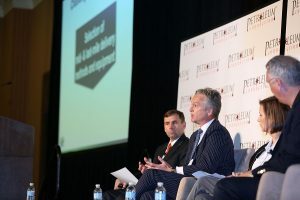 From demand to equipment developments, through logistics and industry trends, this year’s conference revealed the latest activity leading industry companies are taking to optimize their organizations and position themselves for growth in 2019 and beyond. PLG Consulting has been the premier frac sand logistics and supply chain consultant over the past eight years and has completed over 50 frac sand-related projects with operators, investors and numerous other clients in all aspects of the supply chain. If you would like to improve your frac sand supply chain and logistics, contact us today.